Preheat skillet to medium high heat. Lightly brush mushrooms with olive oil. Sprinkle salt and pepper. Place mushrooms round side down in skillet. Cook about 4 to 5 minutes on each side, or until tender. Spread light mayonnaise on each slice of bread, add mushrooms and romaine lettuce, top with remaining bread slice. Enjoy! I am not a mushroom fan but the rest of my family is - healthy and awesome! 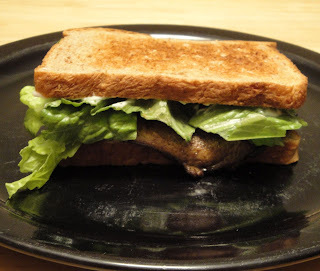 You know I love mushrooms to death but, have never tried portabella mushrooms and with the romaine lettuce, it sounds really good and of course healthy. Thanks for sharing. Veggie burger does not always mean lacking in taste and portabellas are a great sub for meat! There are some bonuses here-healthy, tasty and easy to prepare. Great post! I love the look of this burger, portabella mushrooms are so expensive here though. Looks good! great info and lovin gthis veggie burger! I love your posts! Romain Lettuce is so common on Greece..! I love it! Have a wonderful day! This looks fantastic--I think I would just add a sauce with a bit of wasabi for my taste. Portabellas are so meaty and tasty. Christine this is faboulous, I love portebellos and as a burger it is tops. The first time I had a portabella burger, I didn't think I would like it. Boy was I wrong! I too love the romaine lettuce and this is the one I go for now. I can imagine the taste of this burger you have made, what more the crunchy taste from the lettuce. This lettuce has become so easily available at my place and the price seems very reasonable, so all the more I buy it so often now. I love substituting portobellos for meat! Great recipe and agreed with the romaine. I love portabella burgers, on sesame buns with ketchup and mustard, just like a real burger! Thanks for stopping by. I love all your comments. Portabella burgers are great! They remind me of summertime, I'd have these all the time with a smear of goat cheese... yum :) Your's looks delicious! And I love all of the info on romaine lettuce, thats my favorite lettuce for sandwiches! This sounds delish! it's simple and healthy too! Will def try this soon! Great post! I love mushroom burgers and yours sounds delish! I need to remember to add portabella mushrooms to the grocery list. I never remember to get some and they add so much flavor to dishes. Great sandwich! Yummy and healthy!! Love it!